Tobacco habit is one of the main etiological factors responsible for cancer in body's multiple organs due to the presence of numerous carcinogens. In different animal models, it was evident that the carcinogens could induce carcinogenesis in multiple organs depending on its route of exposure site (e.g., skin, oral cavity, and lung), metabolism (e.g., liver and lung), and excretion (e.g., lung and kidney). It was evident that the active carcinogen metabolites could induce cellular reactive oxygen species (ROS) level, bind to DNA/RNA/proteins, thereby transforming the stem cell of the specific organs toward neoplasm. Different epidemiological studies including our own showed few natural compounds might reduce the risk of tobacco-induced carcinogenesis. The anticarcinogenic roles of crude extract as well as active compounds of such natural dietary ingredients were also evaluated by several in vivo animal models. Most of the active components have potential antioxidative, anti-inflammatory, and anticarcinogenic roles. For better understanding, the roles of three different types of compounds were selected for this review 1. Tea polyphenols from Camellia sinensis: epigallocatechin gallate and theaflavin; 2. amarogentin from Swertia chirata; and 3. Eugenol from Syzygium aromaticum. Studies showed that three types of compounds could restrict the carcinogenesis in different organs at premalignant stages. This might be due to antioxidation and activation of detoxification system, inhibition of cancer initiating stem cell population, modulation of multiple cellular pathways associated with cell cycle, cell proliferation, and survival which ultimately lead to restrict tumor development at initiation/promotion stage. Cancer is now accepted to be a major lifestyle disease. Despite the enormous research and rapid development in treatment modalities seen during the past decade, cancer continues to be a worldwide killer disease. Statistics showed that cancer is the second most common cause of death after heart disease. Tobacco use is a leading cause of cancer due to the presence of multiple carcinogens (accounts for at least 30% of all cancer deaths). Studies demonstrated the association of tobacco habit with cancers in multiple organs such as in head and neck, lung, liver, pancreas, stomach, kidney, urinary bladder, cervix, and colorectal., If cancer is detected in early stages, better treatment outcome may be possible such as surgery, chemotherapy, radiotherapy etc. However, in many cases, the incidence of recurrence and side effects is very high. Therefore, constant researches are being done to develop new cancer treatments that should have no side effects and be low expensive. In this context, different natural compounds from different dietary products are now being highlighted to be highly effective anticarcinogenic agents providing a suitable and an effective alternative for cancer prevention and therapy. Thus, in this review, we want to discuss at first how different tobacco-associated carcinogens induce carcinogenesis in different organs using different animal carcinogenesis models. Second, we want to evaluate how some natural compounds, for example, tea polyphenols, amarogentin, and eugenol could restrict the tobacco-induced carcinogenesis. Thus, this review may have broad implication in cancer prevention and therapy along with conventional cancer management. Nicotine addiction is the reason that people continue to use tobacco. While nicotine itself is not considered to be carcinogenic, smoking tobacco (such as cigarette, bidi, cigar, and pipe) or smokeless forms of tobacco (chewing tobacco) contain a mixture of carcinogens and many of them have been classified by the International Agency for Research on Cancer (IARC) as Group 1: “Carcinogenic to humans” as well as to animal [Table 1]. These carcinogens include polycyclic aromatic hydrocarbons (PAHs), N-nitrosamines, and other organic and inorganic compounds [Table 1]. In addition, vapor phase of tobacco smoke contains carbon monoxide, benzene, ammonia, formaldehyde, hydrogen cyanide, N-nitrosodimethylamine, and N-nitrosodiethylamine (NDEA).,, The multiple carcinogens in tobacco caused cancers in multiple organs such as oral cavity, pharynx, larynx, esophagus, nasal cavity, paranasal sinuses, nasopharynx, lung, stomach, liver, pancreas, kidney, cervix uteri, lower urinary tract including renal pelvis, bladder, and blood of human (IARC monographs, 1986). Similarly, in animal models such as mouse, rat, and hamster, the tobacco-associated carcinogens, for example, benzo[a]pyrene and N-nitrosoamines, induced carcinogenesis in multiple primary and secondary organs depending on it exposure site/route of administration (e.g., oral cavity, lung, and skin), metabolism (e.g., liver and lung), and excretion (e.g., kidney and lung) [Table 1]. These animal models were studied extensively to understand the tobacco-induced carcinogenesis. It was evident that the carcinogens cause the formation of ROS, carbon-centered radicals, and target cellular macromolecules directly or indirectly depending on their mode of action.,,, Alkylating agents bind directly with DNA and modify it; thus they are defined as “genotoxic” or “direct” carcinogens. Another group of carcinogens, for example, aromatic amines, azoamino dyes, and PAH require metabolic activation by cytochrome P450-catalyzed α-hydroxylation reaction to form the ultimate carcinogen which bind to biological macromolecules such as DNA, RNA, and proteins and are termed as “indirect” or “pro-carcinogen.”, The relative metabolic activity of different organs toward the same compound also varies among species. The majority of the cytochrome P450 isoforms are found in the liver; however, other extrahepatic sites include gastrointestinal tract, kidney, lungs, and adrenal glands. Thus, these organs were suggested to be affected by the carcinogens. In addition, tissues that normally undergo rapid stem cell renewal such as skin and blood are expected to experience increased genotoxic damage and cancer incidence following exposure of the carcinogens. In response to the genotoxic stimulation, normal stem cell transformed to tumor-initiating clones or cancer stem cells which incur unregulated proliferation and survival advantages representing a deviation from the return to quiescence and manifest carcinogenesis. The initial damage is genetically fixed and then compounded causing the irreversible conversion to an expanded initiated clone, a process called initiation of carcinogenesis. Further damage to this clone would provide an impact for further progress of the carcinogenic process, called the promotion of carcinogenesis. Finally, the transformed clones progress to form benign tumors followed by malignant neoplasms which capable of invading adjacent tissues and metastasizing to distant sites., Thus, tobacco habit has a potential role to initiate carcinogenesis in many organs. Therefore, preventing nicotine addiction, improving smoking cessation strategies as well as blocking carcinogen activation, enhancing detoxification system, or inhibition of downstream events to from DNA/RNA/protein adducts by chemopreventive agents would be an important aspect in prevention and therapy. Cancer is a genetic disease, and tobacco habit is one of the main etiological factors responsible for carcinogenesis in multiple organs. Chemoprevention may be an alternative intervention to reverse, suppress, or prevent the carcinogenesis. In epidemiological studies, many natural products showed a potential effect in prevention of tobacco-induced cancer risks. The anticarcinogenic effects of such natural products have also been found to inhibit the carcinogenesis, at least in animal models. There are many ongoing clinical trials to test the safety and efficacy of natural agents in preventing or treating cancer. These includes tea polyphenols (from green/black tea), curcumin (from turmeric), resveratrol (from grapes, berries, etc. ), amarogentin (from Swertia chirata), plumbagin (from black walnut), eugenol (from clove) etc. which showed potential anticancer effect in different preclinical studies against different cancers [Table 2]. Some of these showed a promising effect in clinical trials also [Table 2]. However, these natural compounds showed varying efficacy against different cancers, but the molecular roles were more or less similar [Table 2]. For better understanding of the chemopreventive effects against different tobacco associated carcinogenesis, three different types of natural compounds are selected for this present review article. (1) Tea polyphenols: epigallocatechin gallate (EGCG) and theaflavin (TF) from Camellia sinensis, (2) amarogentin from S. chirata, and (3) eugenol from Syzygium aromaticum. 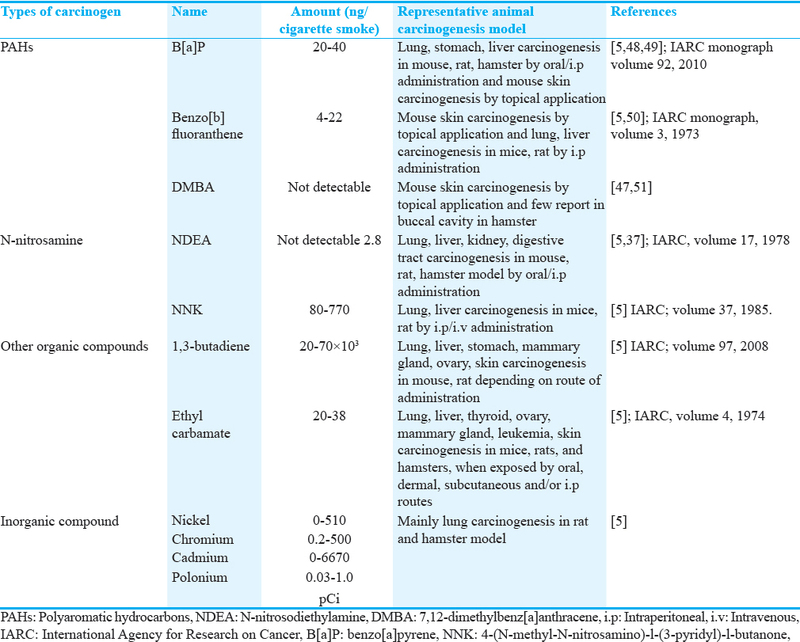 Different studies highlighting their anticarcinogenic activities against tobacco-associated carcinogenesis in different organs are listed in [Table 3]. In population-based studies, it was evident that regular use of black tea (≥4 cups) could reduce tobacco-associated ROS generation and DNA damage in oral epithelium of normal individual., Similarly, different epidemiological studies suggested that daily tea habit might prevent the risk of different human cancers such as stomach cancer, esophageal cancer, breast cancer, pancreatic, ovarian, prostate, and lung cancers associated with tobacco/alcohol habit., In animal models, the first demonstration of chemopreventive effect of tea was evident on mouse skin carcinogenesis. Later, it was evident that both pretreatment, continuous administration, or treatment at post- initiation stages of tea infusion and/ its active polyphenols, i.e., EGCG and TF through mainly oral route or through intraperitoneal or topical administration could restrict progression of different tobacco-induced carcinogenesis such as 7,12-dimethylbenz[a]anthracene (DMBA)-induced mouse skin carcinogenesis, azoxymethane-induced rat colon carcinogenesis, benzo[a]pyrene-induced mouse lung carcinogenesis, and NDEA-induced mouse tongue and liver carcinogenesis at premalignant stages [Table 3]. Similar pattern of chemoprevention was also evident in other organs also [Table 3]. These studies showed that the tea polyphenols could restrict the tobacco-associated carcinogenesis by serving as antioxidant and inducing detoxification system, inhibiting CD44 positive stem cell population and their self-renewal Wnt and Hedgehog pathways, inhibiting cell cycle, cell signaling, and angiogenesis, inducing apoptosis, and facilitating epigenetic modifications along with modulating spliceosomal UsnRNA metabolism [Table 3]. Few studies reported that green tea polyphenols could differentially prevent the multiorgan carcinogenesis in different organs induced by either NDEA alone or in combination with different other carcinogens [Table 3]. Very recent study of our own revealed that both of the components can restrict multiorgan carcinogenesis simultaneously in tongue and liver induced by oral administration of NDEA at early premalignant lesions. However, at the same doses, no toxic effects were seen in normal cells. But, how the tea polyphenols could regulate multiple biological activities and signaling pathways at a time during chemoprevention is not known clearly. It was evident that the tea polyphenols could modulate membrane organization by interacting lipid raft protein, thereby regulating multiple ligand-receptor-mediated signaling., The structure of the polyphenols is responsible for their stability, antioxidant activity as well as binding to nucleic acids and proteins.,, This binding might regulate chromatin modification, posttranscription, and translational modifications as well as regulate activity of multiple enzymes and signaling molecules as evident in different experimental models.,, In addition, tea polyphenols could regulate the activity of DNA methyltransferases (DNMT1 and DNMT3A), histone acetyltransferase, topoisomerase II histone deacetylases (HDAC1 and HDAC3), and telomerase reverse transcriptase gene resulting epigenetic modifications of multiple genes and regulation of cellular replicative potential.,,,,,, As a result, tea polyphenols activate the body's detoxification metabolism and inhibit proliferation and survival of tumor-initiating clone/stem cells to be in early premalignant stages to restrict the carcinogenesis in body's multiple organs. Chirata extract (S. chirata) and its active component amarogentin showed promising cancer preventing and therapeutic effects in different preclinical models [Table 3]. Since ancient times, chirata extract was used as ayurvedic medicines against different gastrointestinal disorders. The amarogentin, a secoiridoid glycoside compound of the plant, is responsible mainly for the biological activities and anticancer efficacy of chirata extract. Previous studies showed that it is a potent inhibitor of Type I DNA topoisomerase in Leishmania donovani., The anticarcinogenic role of the crude extract and amarogentin was first reported by Saha et al. in a DMBA-induced mouse skin carcinogenesis model where it inhibited lipid peroxidation and papilloma formation due to inhibition in cellular proliferation and induction of apoptosis [Table 3]. Later, chemopreventive and therapeutic effect of amarogentin was demonstrated in a liver carcinogenesis mouse model., It was evident that continuous oral administration of the amarogentin or treatment at post- initiation stages could restrict hepatocellular carcinoma development induced by the tobacco-associated carcinogen NDEA at early dysplastic stages. This restriction was found to be associated with the reduction of CD44 positive stem cell population, inactivation of self-renewal Wnt and Hedgehog pathways, inhibition of G1/S phase of cell cycle checkpoint, and induction of apoptosis. However, more studies needed to find out the exact molecular targets in this regard. However, these studies indicate that similar to the tea polyphenols, amarogentin could induce detoxification system and inhibit proliferation and survival of tumor-initiating stem cell population to be in early dysplastic stages in restriction of tobacco-induced carcinogenesis. Clove (S. aromaticum) is one of the important spices used regularly in Asian countries. Cancer chemopreventive potential of aqueous clove extract was first evident in a murine lung carcinogenesis model induced by benzo[a]pyrene [Table 3]., The eugenol (4-allyl-2-methoxyphenol) is the main active compound present in clove extract. However, other plants such as basil, cinnamon, and bay leaves also contain a significant amount of the eugenol. Eugenol is also widely used as a general antiseptic and analgesic in medical and dental practice on account of its potent fungicidal, bactericidal, antioxidant, and anti-inflammatory properties., The anticancer role of eugenol against tobacco-associated carcinogens is not yet studied very extensively still the study took place so far are listed in [Table 3]. DMBA-induced mouse skin tumor was inhibited by radical scavenging activity of eugenol applied topically. Benzo[a]pyrene-induced skin carcinogenesis was also partially inhibited by topical application of eugenol in Swiss albino mice. Similarly, Kaur et al. showed that topical application of the eugenol could inhibit DMBA- TPA induced mouse skin carcinogenesis by preventing oxidative stress and inflammation and inducing apoptosis. In our laboratory, DMBA-croton oil-induced skin carcinogenesis was restricted by oral administration of eugenol at early premalignant stages by reducing cellular proliferation and inducing apoptosis. Thus, the clove extract and eugenol may be used as potential cancer preventive and therapeutic agents against tobacco-induced carcinogenesis. Tobacco habit is responsible for carcinogenesis in multiple organs due to presence of multiple carcinogens. Some of the carcinogens such as NDEA, benzo[a]pyrene, etc present in varying concentration in tobacco, are widely used for carcinogenesis study in animal models. Tobacco-associated carcinogens either directly or after metabolism could induce cellular ROS generation or form DNA/RNA/protein adducts resulting neoplastic transformation of initiating stem cell [Figure 1]. Different natural compounds showed potential anticancer effects in different preclinical studies, and some of these showed promising result in clinical trials [Table 2]. Tea polyphenols such as EGCG and TF, amarogentin from chirata, and eugenol from clove extract prevented different carcinogenesis in animal models induced by different tobacco-associated carcinogens at early premalignant stages. The chemopreventive mechanisms of all the compounds are more or less similar and mainly activate body's detoxification system as well as inhibit carcinogenesis progression from initiation/promotion which are summarized in [Figure 1]. The molecular mechanisms of the chemoprevention are associated with antioxidation and activation of detoxification systems, inhibition of cell proliferation, and survival of tumor-initiating clones. Thus, the natural compound can be used as potential cancer preventing agents as well as therapeutic agents either alone or in combination with conventional therapies against different tobacco-associated carcinogenesis. Studies in the review were financially supported by the National Tea Research Foundation, Kolkata, India, and Council of Scientific and Industrial Research, New Delhi, India. Jemal A, Siegel R, Ward E, Murray T, Xu J, Thun MJ. Cancer statistics, 2007. CA Cancer J Clin 2007;57:43-66. Hart CL, Davey Smith G, Gruer L, Watt GC. The combined effect of smoking tobacco and drinking alcohol on cause-specific mortality: A 30 year cohort study. BMC Public Health 2010;10:789. World Health Organization. WHO Report on the Global Tobacco Epidemic, 2011: Warning About the Dangers of Tobacco. Geneva, Switzerland: World Health Organization; 2011. Safarzadeh E, Sandoghchian Shotorbani S, Baradaran B. Herbal medicine as inducers of apoptosis in cancer treatment. Adv Pharm Bull 2014;4 Suppl 1:421-7. Hecht SS. Tobacco smoke carcinogens and lung cancer. J Natl Cancer Inst 1999;91:1194-210. Bhisey RA. Chemistry and toxicology of smokeless tobacco. Indian J Cancer 2012;49:364-72. Taioli E. Gene-environment interaction in tobacco-related cancers. Carcinogenesis 2008;29:1467-74. Hecht SS. Progress and challenges in selected areas of tobacco carcinogenesis. Chem Res Toxicol 2008;21:160-71. Hebels DG, Briedé JJ, Khampang R, Kleinjans JC, de Kok TM. Radical mechanisms in nitrosamine- and nitrosamide-induced whole-genome gene expression modulations in Caco-2 cells. Toxicol Sci 2010;116:194-205. Anzenbacher P, Anzenbacherová E. Cytochromes P450 and metabolism of xenobiotics. Cell Mol Life Sci 2001;58:737-47. Beachy PA, Karhadkar SS, Berman DM. Tissue repair and stem cell renewal in carcinogenesis. Nature 2004;432:324-31. Perez-Losada J, Balmain A. Stem-cell hierarchy in skin cancer. Nat Rev Cancer 2003;3:434-43. Slaga TJ. Host factors in the susceptibility of mice to tumour initiating and promoting agents. IARC Sci Publ 1983;51:257-73. DiGiovanni J. Multistage carcinogenesis in mouse skin. Pharmacol Ther 1992;54:63-128. Gullett NP, Ruhul Amin AR, Bayraktar S, Pezzuto JM, Shin DM, Khuri FR, et al. Cancer prevention with natural compounds. Semin Oncol 2010;37:258-81. Lambert JD. Does tea prevent cancer? Evidence from laboratory and human intervention studies. Am J Clin Nutr 2013;98 6 Suppl: 1667S-75S. Khan N, Mukhtar H. Tea and health: Studies in humans. Curr Pharm Des 2013;19:6141-7. Pal D, Banerjee S, Indra D, Mandal S, Dum A, Bhowmik A, et al. Influence of regular black tea consumption on tobacco associated DNA damage and HPV prevalence in human oral mucosa. Asian Pac J Cancer Prev 2007;8:263-6. Pal D, Sur S, Mandal S, Das S, Panda CK. Regular black tea habit could reduce tobacco associated ROS generation and DNA damage in oral mucosa of normal population. Food Chem Toxicol 2012;50:2996-3003. Kanwar J, Taskeen M, Mohammad I, Huo C, Chan TH, Dou QP. Recent advances on tea polyphenols. Front Biosci (Elite Ed) 2012;4:111-31. Yoshizawa S, Horiuchi Y, Fujiki H, Yoshida T, Okuda T, Sugimura T. Antitumor promoting activity of (−)-epigallocatechin gallate, the main constituent of “Tannin” in green tea. Phytother Res 1987;1:44-7. Sur S, Pal D, Roy R, Barua A, Roy A, Saha P, et al. Tea polyphenols EGCG and TF restrict tongue and liver carcinogenesis simultaneously induced by N-nitrosodiethylamine in mice. Toxicol Appl Pharmacol 2016;300:34-46. Tsukamoto S, Hirotsu K, Kumazoe M, Goto Y, Sugihara K, Suda T, et al. Green tea polyphenol EGCG induces lipid-raft clustering and apoptotic cell death by activating protein kinase Cd and acid sphingomyelinase through a 67 kDa laminin receptor in multiple myeloma cells. Biochem J 2012;443:525-34. Patra SK, Rizzi F, Silva A, Rugina DO, Bettuzzi S. Molecular targets of (−)-epigallocatechin-3-gallate (EGCG): Specificity and interaction with membrane lipid rafts. J Physiol Pharmacol 2008;59 Suppl 9:217-35. Frei B, Higdon JV. Antioxidant activity of tea polyphenols in vivo: Evidence from animal studies. J Nutr 2003;133:3275S-84S. Wan SB, Chen D, Dou QP, Chan TH. Study of the green tea polyphenols catechin-3-gallate (CG) and epicatechin-3-gallate (ECG) as proteasome inhibitors. Bioorg Med Chem 2004;12:3521-7. Li Y, Tollefsbol TO. Impact on DNA methylation in cancer prevention and therapy by bioactive dietary components. Curr Med Chem 2010;17:2141-51. Murugan RS, Vinothini G, Hara Y, Nagini S. Black tea polyphenols target matrix metalloproteinases, RECK, proangiogenic molecules and histone deacetylase in a rat hepatocarcinogenesis model. Anticancer Res 2009;29:2301-5. Moseley VR, Morris J, Knackstedt RW, Wargovich MJ. Green tea polyphenol epigallocatechin 3-gallate, contributes to the degradation of DNMT3A and HDAC3 in HCT 116 human colon cancer cells. Anticancer Res 2013;33:5325-33. Daniel M, Tollefsbol TO. Epigenetic linkage of aging, cancer and nutrition. J Exp Biol 2015;218(Pt 1):59-70. Khan N, Mukhtar H. Multitargeted therapy of cancer by green tea polyphenols. Cancer Lett 2008;269:269-80. Li WG, Li QH, Tan Z. Epigallocatechin gallate induces telomere fragmentation in HeLa and 293 but not in MRC-5 cells. Life Sci 2005;76:1735-46. Suryawanshi S, Asthana RK, Gupta RC. Assessment of systemic interaction between Swertia chirata extract and its Bioactive constituents in rabbits. Phytother Res 2009;23:1036-8. Medda S, Mukhopadhyay S, Basu MK. Evaluation of the in vivo activity and toxicity of amarogentin, an antileishmanial agent, in both liposomal and niosomal forms. J Antimicrob Chemother 1999;44:791-4. Ray S, Majumder HK, Chakravarty AK, Mukhopadhyay S, Gil RR, Cordell GA. Amarogentin, a naturally occurring secoiridoid glycoside and a newly recognized inhibitor of topoisomerase I from Leishmania donovani. J Nat Prod 1996;59:27-9. Pal D, Sur S, Mandal S, Das A, Roy A, Das S, et al. Prevention of liver carcinogenesis by amarogentin through modulation of G1/S cell cycle check point and induction of apoptosis. Carcinogenesis 2012;33:2424-31. Sur S, Pal D, Banerjee K, Mandal S, Das A, Roy A, et al. Amarogentin regulates self renewal pathways to restrict liver carcinogenesis in experimental mouse model. Mol Carcinog 2016;55:1138-49. Banerjee S, Das S. Anticarcinogenic effects of an aqueous infusion of cloves on skin carcinogenesis. Asian Pac J Cancer Prev 2005;6:304-8. Banerjee S, Panda CK, Das S. Clove (Syzygium aromaticum L.), a potential chemopreventive agent for lung cancer. Carcinogenesis 2006;27:1645-54. Pisano M, Pagnan G, Loi M, Mura ME, Tilocca MG, Palmieri G, et al. Antiproliferative and pro-apoptotic activity of eugenol-related biphenyls on malignant melanoma cells. Mol Cancer 2007;6:8. Kim SS, Oh OJ, Min HY, Park EJ, Kim Y, Park HJ, et al. Eugenol suppresses cyclooxygenase-2 expression in lipopolysaccharide-stimulated mouse macrophage RAW264.7 cells. Life Sci 2003;73:337-48. Ito M, Murakami K, Yoshino M. Antioxidant action of eugenol compounds: Role of metal ion in the inhibition of lipid peroxidation. Food Chem Toxicol 2005;43:461-6. Sukumaran K, Unnikrishnan MC, Kuttan R. Inhibition of tumour promotion in mice by eugenol. Indian J Physiol Pharmacol 1994;38:306-8. Van Duuren BL, Goldschmidt BM. 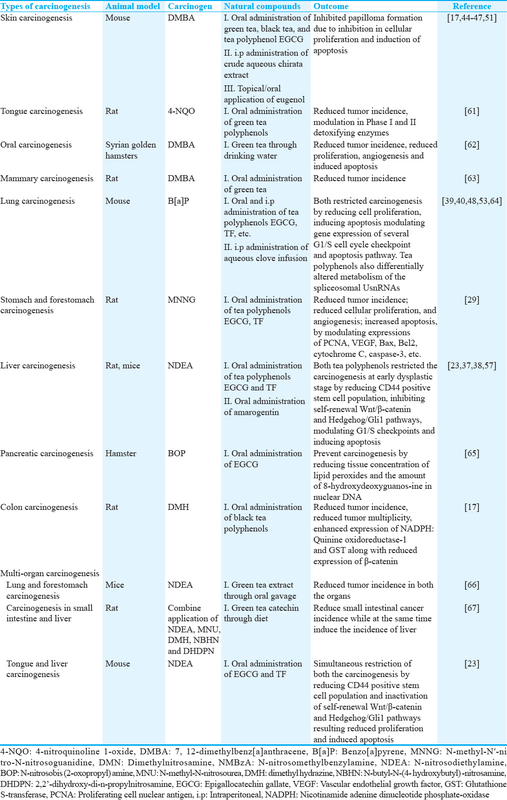 Cocarcinogenic and tumor-promoting agents in tobacco carcinogenesis. J Natl Cancer Inst 1976;56:1237-42. Kaur G, Athar M, Alam MS. Eugenol precludes cutaneous chemical carcinogenesis in mouse by preventing oxidative stress and inflammation and by inducing apoptosis. Mol Carcinog 2010;49:290-301. Pal D, Banerjee S, Mukherjee S, Roy A, Panda CK, Das S. Eugenol restricts DMBA croton oil induced skin carcinogenesis in mice: Downregulation of c-Myc and H-ras, and activation of p53 dependent apoptotic pathway. J Dermatol Sci 2010;59:31-9. Manna S, Mukherjee S, Roy A, Das S, Panda CK. Tea polyphenols can restrict benzo[a]pyrene-induced lung carcinogenesis by altered expression of p53-associated genes and H-ras, c-myc and cyclin D1. J Nutr Biochem 2009;20:337-49. Ruggeri B, DiRado M, Zhang SY, Bauer B, Goodrow T, Klein-Szanto AJ. Benzo[a]pyrene-induced murine skin tumors exhibit frequent and characteristic G to T mutations in the p53 gene. Proc Natl Acad Sci U S A 1993;90:1013-7. Lavoie EJ, Braley J, Rice JE, Rivenson A. Tumorigenic activity of non-alternant polynuclear aromatic hydrocarbons in newborn mice. Cancer Lett 1987;34:15-20. Saha P, Mandal S, Das A, Das PC, Das S. Evaluation of the anticarcinogenic activity of Swertia chirata Buch. Ham, an Indian medicinal plant, on DMBA-induced mouse skin carcinogenesis model. Phytother Res 2004;18:373-8. Chen D, Wan SB, Yang H, Yuan J, Chan TH, Dou QP. EGCG, green tea polyphenols and their synthetic analogs and prodrugs for human cancer prevention and treatment. Adv Clin Chem 2011;53:155-77. Manna S, Banerjee S, Mukherjee S, Das S, Panda CK. Epigallocatechin gallate induced apoptosis in sarcoma 180 cells in vivo: Mediated by p53 pathway and inhibition in U1B, U4-U6 UsnRNAs expression. Apoptosis 2006;11:2267-76. Wang J, Jiang YF. 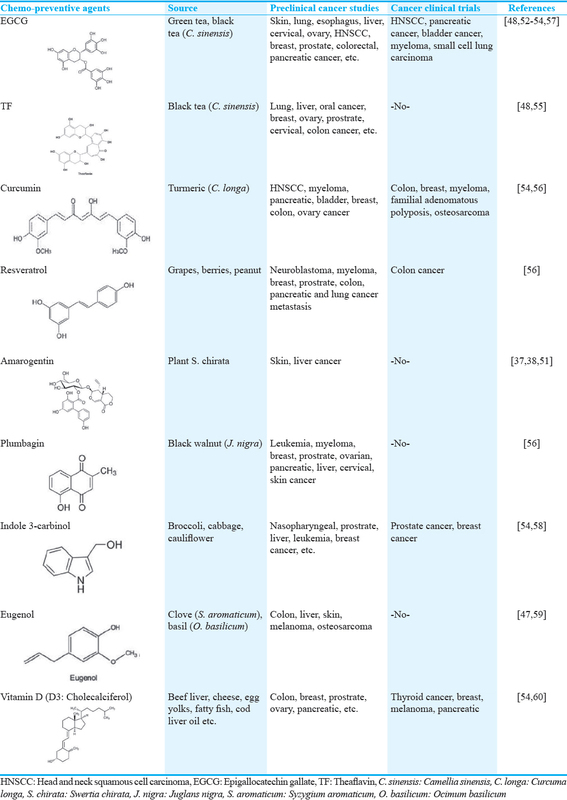 Natural compounds as anticancer agents: Experimental evidence. World J Exp Med 2012;2:45-57. Mujtaba T, Dou QP. Black tea polyphenols inhibit tumor proteasome activity. In Vivo 2012;26:197-202. Juárez P. Plant-derived anticancer agents: A promising treatment for bone metastasis. Bonekey Rep 2014;3:1-8. Sur S, Pal D, Mandal S, Roy A, Panda CK. Tea polyphenols epigallocatechin gallete and theaflavin restrict mouse liver carcinogenesis through modulation of self-renewal Wnt and hedgehog pathways. J Nutr Biochem 2016;27:32-42. Chen Z, Tao ZZ, Chen SM, Chen C, Li F, Xiao BK. Indole-3-carbinol inhibits nasopharyngeal carcinoma growth through cell cycle arrest in vivo and in vitro. PLoS One 2013;8:e82288. Majeed H, Antoniou J, Fang Z. Apoptotic effects of eugenol-loaded nanoemulsions in human colon and liver cancer cell lines. Asian Pac J Cancer Prev 2014;15:9159-64. Garland CF, Garland FC, Gorham ED, Lipkin M, Newmark H, Mohr SB, et al. The role of Vitamin D in cancer prevention. Am J Public Health 2006;96:252-61. Srinivasan P, Suchalatha S, Babu PV, Devi RS, Narayan S, Sabitha KE, et al. Chemopreventive and therapeutic modulation of green tea polyphenols on drug metabolizing enzymes in 4-Nitroquinoline 1-oxide induced oral cancer. Chem Biol Interact 2008;172:224-34. Li N, Chen X, Han C, Chen J. Chemopreventive effect of tea and curcumin on DMBA-induced oral carcinogenesis in hamsters. Wei Sheng Yan Jiu 2002;31:354-7. Kavanagh KT, Hafer LJ, Kim DW, Mann KK, Sherr DH, Rogers AE, et al. Green tea extracts decrease carcinogen-induced mammary tumor burden in rats and rate of breast cancer cell proliferation in culture. J Cell Biochem 2001;82:387-98. Yang CS, Wang X, Lu G, Picinich SC. Cancer prevention by tea: Animal studies, molecular mechanisms and human relevance. Nat Rev Cancer 2009;9:429-39. Stan SD, Singh SV, Brand RE. Chemoprevention strategies for pancreatic cancer. Nat Rev Gastroenterol Hepatol 2010;7:347-56. Wang ZY, Hong JY, Huang MT, Reuhl KR, Conney AH, Yang CS. Inhibition of N-nitrosodiethylamine- and 4-(methylnitrosamino)-1-(3-pyridyl)-1-butanone-induced tumorigenesis in A/J mice by green tea and black tea. Cancer Res 1992;52:1943-7. Hirose M, Hoshiya T, Akagi K, Takahashi S, Hara Y, Ito N. Effects of green tea catechins in a rat multi-organ carcinogenesis model. Carcinogenesis 1993;14:1549-53.